I didn’t know what to expect from a book about a false marriage. 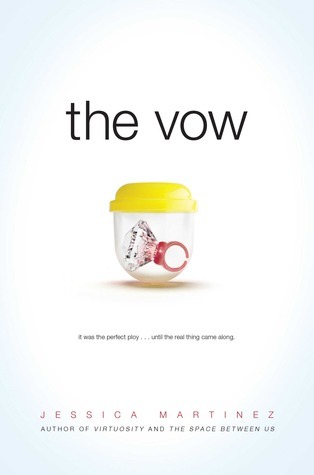 I could only picture something like that Sandra Bullock movie The Proposal, and The Vow is nothing like that at all. Mo and Annie are best friends, with really only the other to count on and trust. (Their lack of friends, or even other acquaintances, was a bit hard to believe. Mo has one friend besides Annie, but Annie has no one else.) So, when it’s a choice between marrying each other or having Mo get deported, I could see why they made the decision they did. The platonic boy/girl friendship is almost unheard of in the contemporary genre, so I really liked the unique perspective. On the topic of perspectives, the narration flips between Annie and Mo. The transitions between each chapter are very odd though and interrupt the flow of the story. As much as I wanted to, I didn’t like Mo. He’s incredibly whiny and quick to play the victim. It was very, very frustrating. And, for being a supposedly intelligent guy, I found it unbelievable that he wouldn’t know marriage fraud was a felony. He even researched it before making any decisions! Also, towards the end of the novel he starts acting out of character and it really undermined the message of the book. I found Annie much more pleasant to read. She is the one always saving Mo and seemed to be the far more loyal friend. When she meets her own love interest, Reed, I wanted her to drop Mo and say hello to him instead. Annie and Reed’s romance was so sweet that I wished there would have been more to it since it was a bit underdeveloped. Overall, I just found too much of this book to be unbelievable. The ending was predictable and, like I said earlier, a bit undermining to what I thought was the theme of the novel. I really liked Annie and want her to have her own story with Reed, whom obviously cares for her more than Mo. The book explores some difficult themes, like racism and true sacrifices. If you do have the opportunity to read The Vow, take it. As much as the book annoyed me, it was nice to read something unlike anything I had read before.